Raven is first to reach the mountain top. Her sister and step-dad are still climbing the trail below. She is alone on top of the world. So she dances - a crazy, jumping, spinning dance. because if you can climb a mountain you can do anything! But then there is a rumble and the earth shakes. Rocks are falling, and so is Raven, in a terrible tumble down the side of the mountain. When she comes to, no one answers her calls. The rockfall is covering the trail where she last saw Lily and Scott. Wendy Orr tells the dramatic story of a girl who goes beyond her limits to save her family - and on the way, discovers a mysterious bond with a family of bears and a raven. Wendy Orr was born in Edmonton, Canada, and spent her childhood in various places across Canada, France, and the USA, but wherever she lived, there were lots of stories, adventures and animals. Wendy fell in love with the mountains when she went to summer camp in the Rockies when she was eight. When she was twelve, she climbed Pike's Peak in Colorado with her father and sister, and will never forget the thrill of reaching the top! 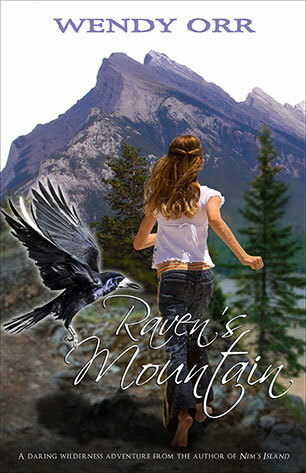 Raven's Mountain is set in the high mountain country of British Columbia in Canada. This area is the home of many wild animals, including grizzlies and black bears. And very occasionally, a rare white Spirit Bear from the central coast of British Columbia has also been spotted further inland. Wendy is the author of several award-winning books, including Nim's Island, Nim at Sea, Spook's Shack, Mokie and Bik, and for teenagers, Peeling the Onion.